The PolarPro Macro Lens for the GoPro Hero4/3+ is an excellent tool for capturing detailed close-up shots you just can’t achieve with the camera alone. The Macro reduces the camera’s focal length allowing the GoPro to focus at distances between 6-30cm (3 -12 inches) away from the subject. 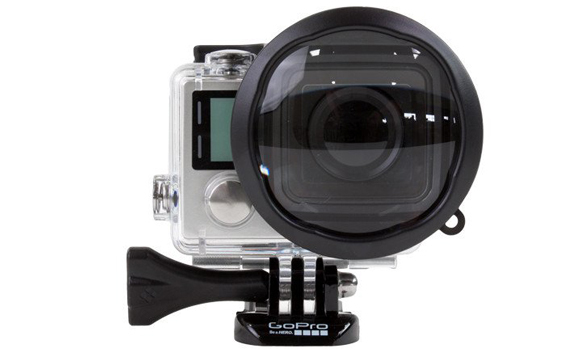 Without a macro lens, the GoPro will not focus on a subject closer than 30cm (12 inches) away. PolarPro’s Macro is a unique tool for capturing creative close-ups for both your photos and videos. The Macro features a simple press on/off installation and a high definition glass lens for beautiful and crisp optics and maximum scratch resistance. The Macro is great to have in your gear bag as it expands the capabilities of the GoPro Hero4/3+’s focal range dramatically.